It did go surprisingly well. I was calm the entire time which is unusual. Every other time in my life when I’ve been put in that kind of a situation my heart races and I get the cold sweats and shakes, but I never experienced that. Instead I experienced Grandma’s love and it sheltered me from all the anxiety. Pretty much one of the most spiritual moments in my life. LuDean Burris Jackson, 83, died Nov. 24, 2010, in Logan, Utah, after a long battle with health challenges. LuDean was born in Logan, Utah, at home on Oct. 3, 1927, the first child of William Thomas Burris and Alveda Lillian Barrett Burris. She attended Logan schools and graduated from Logan High School in 1945. LuDean worked at Logan businesses during and after high school. From the flip of a coin on a double date she met her future husband and eternal companion, Scott Jackson. She and Scott were married June 12, 1946, in the Logan LDS Temple. LuDean was active in the LDS Church, serving in the Young Women and Relief Society programs and as a Logan Temple officiator. She was involved in civic activities and was a good friend to many. She enjoyed the beauties of God’s creations and beautiful music. LuDean is survived by her husband and friend, Scott, and their five daughters; Meriam Nielsen (Alan), Sherrie McKenney (Paul), DeeAnn Davidson (Daniel), Laurie Jackson and Gay Jackson. LuDean is also survived by two brothers and one sister; Keith Burris (Marye), Ronald Burris (Elaine), Carol Godfrey (Joe). 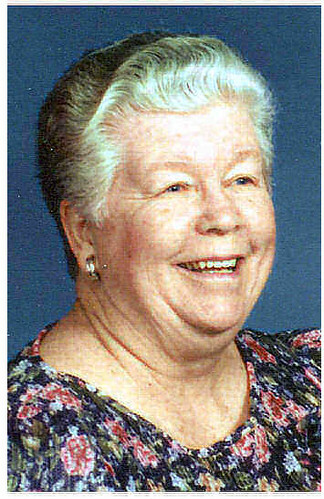 She loved her family as much as life and was a loving grandmother to 15, special great-grandmother to 19 and one coming in May. I think a letter is an appropriate way to honor you. As I gathered my thoughts and memories of you I asked my siblings and cousins to share with me their memories. Each one of us agree that we will miss your letters and cards. You never missed a holiday or reason to send a note.You wrote personal letters to each of us when we needed words of encouragement. You wrote me almost every week when I was younger and learning to spread my wings. Remember the summer I spent in Alaska? The highlight of each week was when I found a letter from you. You knew I needed that connection to family when everything seemed so far away. I have learned that you did this for us all, we all have received letters of encouragement and love just when we needed it the most. How lucky are we to have these hand written words to keep close to our hearts to remember you with. I know that family was the foundation of your life. You gave unconditional love to all of us. You would light up when ever we were together, especially around the wee ones. We felt your pride and your joy when we were together. You always greeted everyone with a smile and a hug. I will miss how you greeted us with genuine joy as we walked up the back steps into the kitchen. Your love for Grandpa and his for you was something to behold. What a beautiful marriage you shared with Grandpa. You were so devoted and it was so easy to see that you were best friends. I love the fact that Grandpa kissed you goodnight every evening. I cherish the sweet story of the coin toss to win the first date with you. This love for family and friends radiated from you and made you such a positive person. You have endured so much with all your ailments you never complained you didn’t let it bring you down and depress you. You stayed positive and I think that took a lot of strength. Your positive attitude has had a far reach. We have always been amazed at how well you’ve handled the pain and frustration of diabetes. You have shown us how to rise above and be happy. Grandma you knew that the key to life was to cultivate relationships and through that there is love. What a beautiful life you lived with so much love in your heart. What a wonderful example you are. I never heard you speak ill of anyone I only witnessed you make more and more friendships along the way and those friendships were so honest and true. You have taught us through example that life is about love. I am so honored to have your legacy to follow. You are the ultimate matriarch. I miss you Grandma. I thought I had no more tears to shed by now. I was wrong. I love you Danette. Thank you for that beautiful tribute to my mother. I know she cherishes that letter. What a moving letter, Danette. I am sorry for your loss. It sounds like you did an amazing job. Love ya! It was a beautiful letter Danette. You are a beautiful person! Love you! Awww i ssssoooo totally wanted to be there. I would have cried like a little baby. I was going through my room today and found the last letter she wrote to me. I cried as usual. I just found this post and I wanted to let you know what a beautiful job you did. You said all the right things and did it with such grace. Thank you for being our spokesperson, as I feel we all felt like you did.